Oxygen is vital to life. Very small organisms can get enough oxygen passively from their surroundings, but larger, more complicated organisms need to have better mechanisms for getting oxygen to the cells. Medium-sized organisms such as insects can manage to pump air to their tissues via a system of tubes leading in from pores along their bodies. Organisms bigger than that need a more complicated circulation system involving arteries and veins. Oxygen dissolves pretty well in water, but we can get even more oxygen into our system by binding it to carrier molecules. The most common carrier molecule for oxygen, used by vertebrates like us, is hemoglobin. 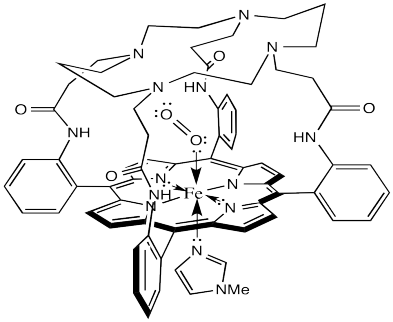 Hemoglobin contains a five-coordinate Fe(II) centre in a heme or porphyrin ligand. In the picture, only the coordination complex is shown, stripped of the surrounding protein. Also, there are other groups attached to the porphyrin (the nitrogen-containing ring) but they are left out of the picture for simplicity. Oxygen binds to the iron in the heme, forming an octahedral iron complex. This form is called oxyhemoglobin; the form without the bound oxygen is called deoxyhemoglobin. Lots of interesting things happen as a result of oxygen binding, structurally speaking. First of all, the heme changes shape. In order to accommodate the change from a pseudo-square planar geometry to an octahedral one, the shape of the heme changes from a distorted bowl to a plane. Sometimes, keeping track of oxidation states in coordination complexes is easier if using dative bond formalisms. In particular, if a donor arom is neutral, the bond to the metal is shown using a dative bond symbol. That's a short, straight arrow from the donor electron pair to the metal. Bonds between anionic donor atoms and the metal are shown as regular short lines, as we typically draw other bonds. 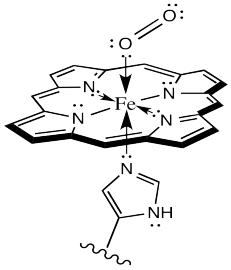 Looking at the complex that way, it is easier to see that the iron atom is depicted as Fe(II); it has two anionic nitrogen donors from the heme ring. We'll look into the situation more closely later. Draw d orbital splitting diagrams for the iron porphyrin centre in deoxyhemoglobin and in oxyhemoglobin. Hemoglobin is exceptionally good at transporting oxygen to the tissues not only because it can bind iron tightly under the right conditions, but because it can also let go under the right conditions, releasing oxygen to the tissues. Because hemoglobin is such a complex protein, it has been very difficult to study, although researchers have made impressive strides in undertsanding proteins in recent years. Instead, bioinorganic chemists have developed model compounds to gain insight into hemoglobin and other important biological compounds. Model compounds are relatively simple compounds that possess a number of characteristics of their more complicated cousins. For example, simple porphyrins are relatively easy to make; if you wanted to study oxygen binding with a simple example, an iron-porphyrin complex would be a great model complex. The trouble is, that doesn't work very well. Such a complex binds oxygen irreversibly; it never lets go. Part of the problem is that the oxygen "bridges" to other iron-porphyrin complexes, which wouldn't happen in hemoglobin. In hemoglobin, the heme is buried and protected within the protein. 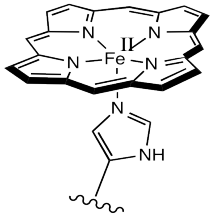 Show the complex that would result if an oxygen molecule bridged between two iron porphyrin complexes. The laboratory of James Collman at Stanford University has been involved in modelling hemoglobin for decades. They succeeded in demonstrating reversible oxygen binding to the "picket fence" porphyrin complex shown below. The bulky tert-butyl groups serve to keep the bound oxygen from bridging to another complex. That alone is an interesting result. It demonstrates that one of the many roles for the protein in this system is to sterically protect the iron heme complex, modifying its reactivity. There is just one small problem. It's called the M value. The M value is an index of the discrimination between oxygen binding and carbon monoxide binding. It's actually the ratio of the partial pressures of the two gases needed to half-saturate the hemoglobin (i.e. so that 50% of iron atoms have bound O2 or CO). The lower the M value, the greater the favourability for O2 binding compared to CO binding. In hemoglobin, this value is about 100, although it will vary from one organism to another. That means hemoglobin binds CO about 100 times better than it binds O2. However, the picket fence heme has an M value over 25,000. That means it is much poorer at binding O2, relatively, than hemoglobin. Why worry about CO binding in these studies? Of course, carbon monoxide poisoning is a serious and potentially fatal condition. There is a deeply problematic consequence of CO poisoning, however, that could be much worse if the M value in an organism was as high as in the picket fence porphyrin. CO is actually a product of the normal breakdown of heme molecules over time in the cell. If our hemoglobin had an M value like that of the picket fence porphyrin, we would all be dead, poisoned by our own metabolic processes. Not content to rest on their laurels, the Collman lab went back to the drawing board and developed lots of other model complexes. For example, the one shown below has an M value closer to 0.005. What does that tell us about hemoglobin? It may be nothing, but it could be indicating another role for the surrounding protein in the hemoglobin molecule. 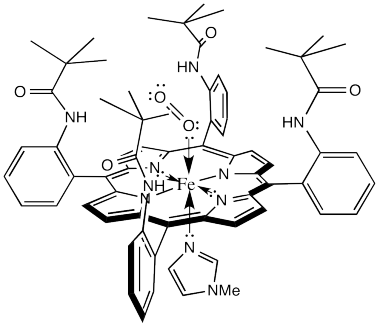 The domed or vaulted model compound suggests a protective covering for the oxygen binding site. Is it possible that O2 can fit inside but CO cannot? It is pretty well-established via other model studies, as well as direct study of oxyhemoglobin, that when oxygen binds to a metal such as iron, the Fe-O-O forms an angle of somewhere around 120 °. The complex has a bent geometry. However, when CO binds to a metal, it does so in a linear fashion. It may be that in a vaulted model complex, the CO simply can't stand up straight, so the complex is destabilized. Presumably, the protein could contribute to a similar destabilization of CO-bound hemoglobin. Why might O2 bind in a bent fashion whereas CO bounds in a linear mode? This idea has been somewhat controversial. Results from quantum mechanical calculations, for instance, suggest that the Fe-C-O bond actually has a fair amount of leeway. These results suggest that the CO can be "tipped over" and still remain strongly bound. Nevertheless, Collman's results provided a useful starting point for further investigations. The protein may play other roles in enhancing oxygen selectivity. X-ray crystallographic studies suggest a role for hydrogen bonding between the "distal histidine" site and bound oxygen. The distal site simply refers to a second nearby histidine, other than the one that is bound to the iron (the "proximal histidine"), and a little further away. 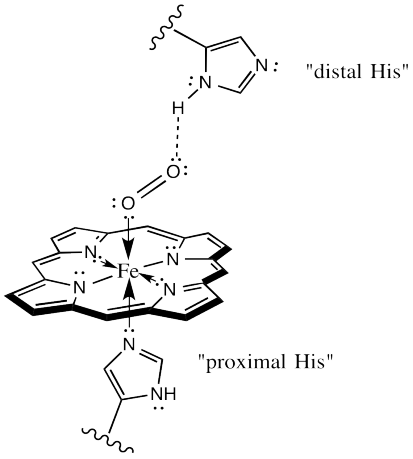 That histidine could be ideally situated to hydrogen bond with bound oxygen, but out of place for optimal interaction with a bound CO. There is one more important event to look at in oxygen binding. Evidence indicates that oxyhemoglobin is actually an Fe(III) species, rather than Fe(II). The iron is oxidized by the bound oxygen. As always, it is useful to map out the movement of electrons, schematically, in this event. Because this event would be a one electron oxidation, we need a different kind of arrow to show where the electrons go. Most of our previous mechanisms have involved electron pairs rather than single electrons. For single electrons, we show a single-headed arrow, rather than a double-headed one. Remember, in the structure on the right, the oxygen bound to iron is considered an anionic donor, shown with a regular line bond instead of a dative arrow. There is something really amazing about that last event. Hemoglobin doesn't form an oxygen complex at all. It forms a complex with superoxide ion, O2-, which it has manufactured itself. When it is ready for delivery to the cells, the superoxide gives back the electron to the iron, and turns back into an everyday oxygen molecule. Describe in words what the curved arrows are showing in the above two schemes. Explain why the oxidation of iron would lead to tighter binding of the oxygen. Modeling studies of Cu(I) complexes like the one below reveal that exposure to O2 results in a square planar Cu(III) peroxide complex (Tolman et al, J. Am. Chem. Soc. 2006, 128, 3445-3458 and references therein). a) Draw the product of the reaction. b) A similar copper complex prepared with the following ligand also binds O2, but with a much lower equilibrium binding constant. Draw the copper complex and the O2 adduct and explain the difference in O2 binding constants. c) DBM (dopamine β-monooxygenase) and a similar copper monooxygenase, PHM (peptidylglycine α-hydroxylating monooxygenase), both contain copper atoms bound to two histidines, a cysteine and a water. Explain the researchers' choice of model compounds above in this context. d) Explain how the cysteine in these active sites might help to control OH radical levels in the cell. We'll see other examples of the reduction of oxygen in the next section. 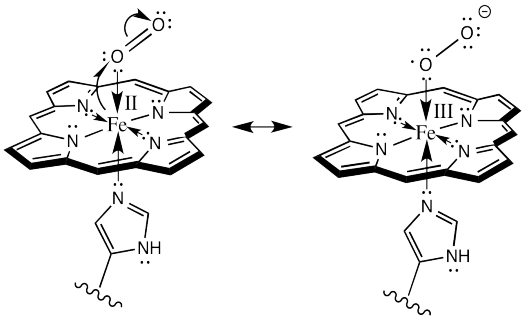 As it turns out, other iron porphyrins play important roles in converting oxygen into other species which are then used to modify substrates.